Canvas Commons provides instructors at Indiana University access to many different valuable resources that can be imported directly into a Canvas course, to supplement existing course content. The process for importing resources from Canvas Commons is straightforward, but knowing where to start is tricky. The following steps will walk you through the process of importing content from Canvas Commons into your Canvas course. 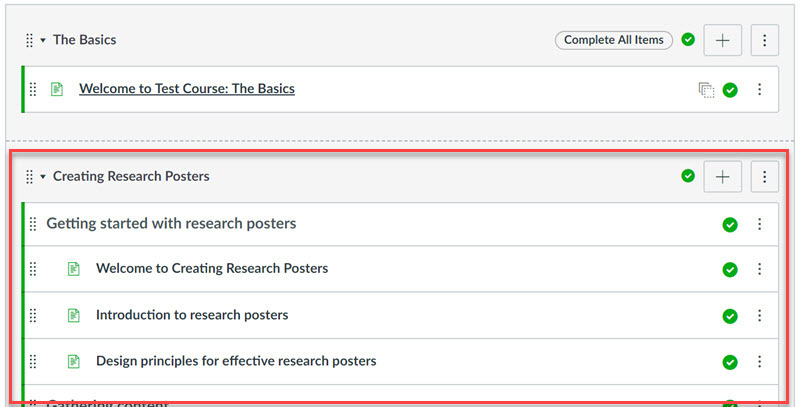 For this example, we'll walk through the process of importing Creating Research Posters into a Canvas course. In Canvas, navigate to the course you wish to import the module into. 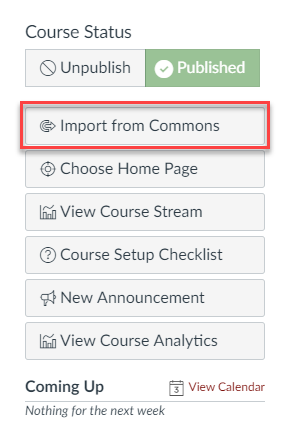 From the Home page of the course, click on the Import from Commons button on the top right side of the screen. The Canvas Commons page will load, and now we can search for content to add. 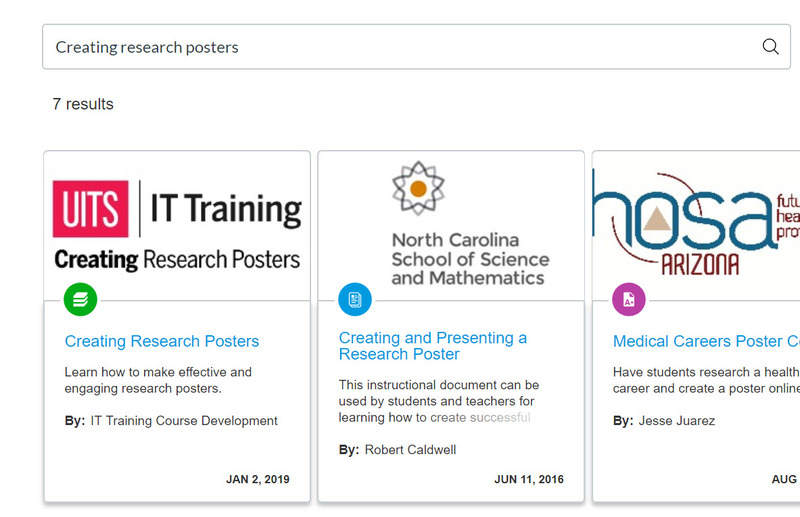 We'll be looking for the module Creating Research Posters. 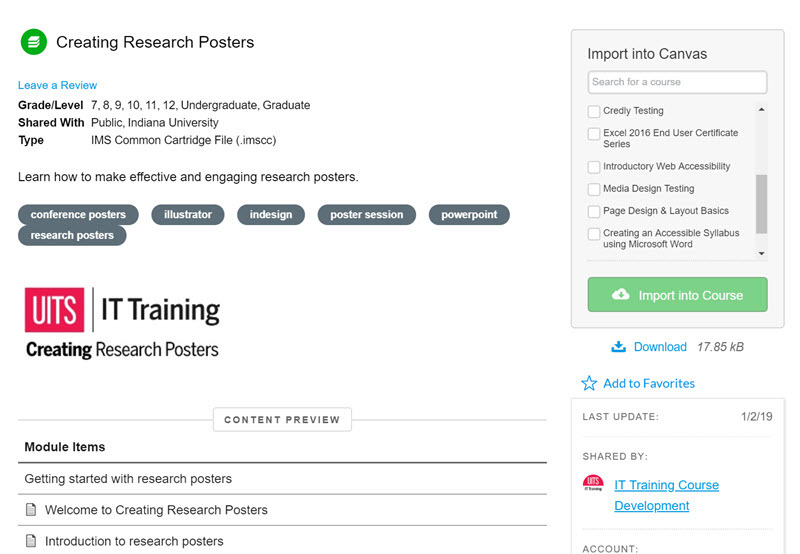 In the search bar underneath the Canvas Commons navigation, type "creating research posters". The site will bring up content that matches your search term as soon as you finish typing. Click on the title of module you wish to import - this will bring you to the module details page. In the Import Into Canvas section on the right side of the screen, click the checkbox for the course(s) you want to import the module into, then click the Import into Course button. A confirmation message will appear at the top of the module details window, and the module will be imported into your Canvas course - this process may take several minutes. When the module appears, it will appear in the Modules section of your course. Once the content is in your course, you can adjust where it appears in your course content and customize the contents of pages in the module to meet your course's needs. IT Training's course modules currently don't have any requirements set. You may want to change the module requirements to require students to view all pages in a course, or remove the requirements entirely if you'd like to remove any you've previously set. The following sections outline how to change or remove the module requirements for one of IT Training's course modules. Go to the module you want to set the requirements for, and click the module options button ( ) at the right side of the top of the module to open the module options menu. In the module options menu, click – this will open the Edit Module Settings dialog box. In the Edit Module Settings dialog box, under the Requirements heading, click the radio button for “Students must complete all of these requirements” to require students to view all the content in a module. If you want, you can also click the checkmark next to “Students must move through requirements in sequential order” to make sure students read through the content in sequential order. Click at the bottom of the Edit Module Settings dialog box to save your changes. At this point, if students have previously satisfied the module requirements, you may get a message asking if you want to re-lock the module or if you want to let students continue in the course without redoing the module. If you want to have students redo the module, click “Re-Lock Modules”. If you want to allow students to continue through the content, click “Continue”. Go to the module you want to remove the requirements for, and click the module options button ( ) at the right side of the top of the module to open the module options menu. In the Edit Module Settings dialog box, under the Requirements heading, click the to the right of the requirement you want to remove. To learn more about working with module requirements in Canvas, view the following page on the Canvas Community site: How do I add requirements to a module?